As a Blogger, I get the opportunity to tell you about so many wonderful brands, products, projects etc. I love what I do. I love it even more when I can share with you a company so great changing lives in my home country Haiti. Deux Mains pronounced deu-meh meaning "Two Hands" in French gave me the opportunity to share with you their fantastic work and I'm super proud to bring them to you. Somewhere very special in Haiti, there is a small workshop, full of love, talent and support. 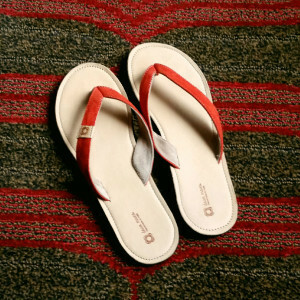 Haitian Artisans create these unique sandals with up cycled tire soles by hand. I love my pair of Yvette sandals. Got them in red. One of my favorite colors! They are super comfortable. and help support this hardworking Haitian community. 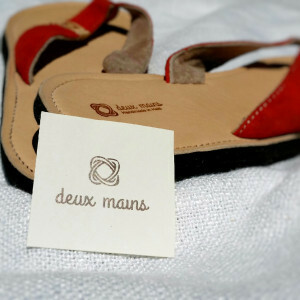 The sandals are stylish, unique, special, handmade and MADE IN HAITI! So, let's hold hands together and tell the world about this.I have my pair and I really like it. Now go on and get yours or buy them as gifts!